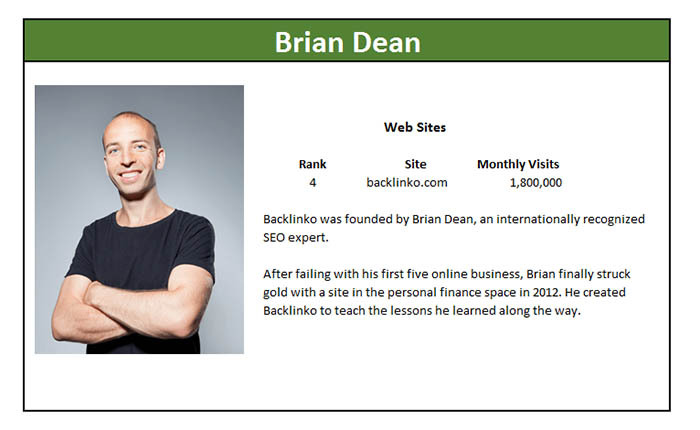 Marketing Master Profile for Brian Dean. What’s This? Brian Dean is a phenom. He hasn’t been around all that long, but has climbed to the top of the game. He got there despite creating very little content relative to his peers, because all of it is powerful. It’s detailed, to the point, and solid gold value for his readers. It gets him not just backlinks and search rankings, but the right backlinks and search rankings to maximize his performance. He’s the precision marksman among his peers, carefully strategizing his moves so that each one gives his brand the maximum push. I’ve learned so much from this guy, but there’s always more each time I go back and reread more information from him. He’s right there with his peers getting about 1.8 million visits a month. Brian has a good mix of channels, perhaps being a little low on Social Media, but making up for it with Email. In fact, his green score on referrals suggests that he writes authoritative content others want to link to. The high email scores suggest that since he doesn’t write very often, his audience signs up and reads what he sends them. He doesn’t waste their time. In fact, his 21.41% email score is 4x more than his peers on average and is the highest score in the Top 15. Only 1 other even breaks into 2 digits. It shouldn’t be surprising that his content quality scores are all above average relative to his peers. He’s tied for 2nd place on average duration and does very well on the other scores too. Dean’s SEO scores are fascinating. Only 2 scored higher on DR/Backlink, and he got highest traffic per backlink by a factor of 2x. His backlink quality score is #2. He’s also above average on Visits / DR. These are high quality backlinks! As far as keywords, Brian Dean really does his keyword research and chooses which ones to target carefully. His traffic / keyword of over 17 is about 2x his nearest competitors and the highest of any of the Top 15 Marketing Masters. While the overall contribution of Social Media to his traffic is low relative to his peers, it’s all coming from Facebook and YouTube, which are generally better for longer form content. Congratulations Brian Dean, spectacular showing!